A fantastic day out, especially if you're on a budget. Me, my husband and our 4 children spent almost the entire day here, spending under £50 which included the admission, meals from the cafe AND the lovely produce we bought from the farm shop!!! This place is a hidden gem, will definitely come again. Me and the kids absolutely loved our visit to Hayrack Farm Park. 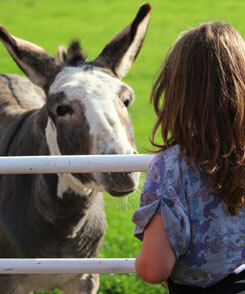 The children loved feeding and petting the animals, who were all so friendly! Watching my children feeding the lambs was a wonderful experience! we were also fortunate to witness the new piglets which had just arrived. A great place to visit. The children spent hours playing on the outdoor equipment and tearing round on the little tractors and when it started to rain, we came inside and they painted a pot to take home while we enjoyed coffee and cake in the cafe! well worth a visit. Check out our facebook page for the latest news and forthcoming events at Hayrack Church Farm.